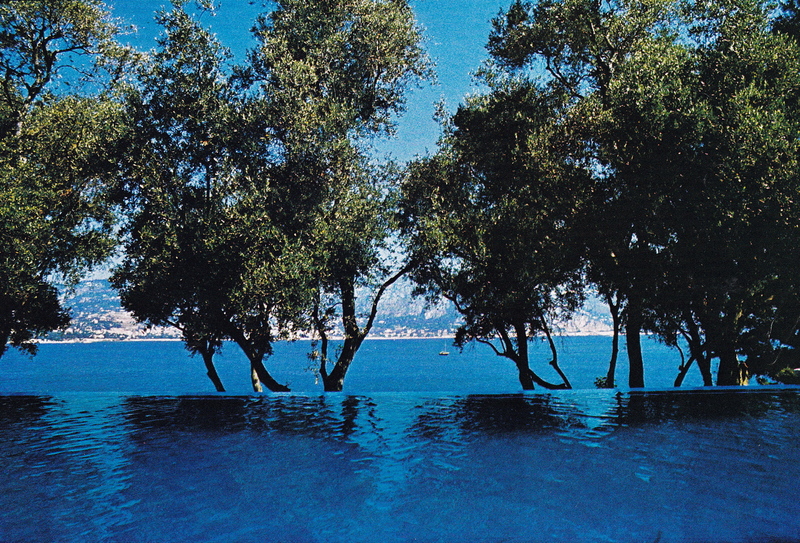 In the last post, Riviera Style, I extolled the sun-kissed charms of the French Riviera’s heyday and inception as playground to the rich and famous, beginning in the early 20th-century, stopping along the way to visit The Gerald Murphy’s at their Villa America in Cap d’Antibes, Coco Chanel at Villa La Pausa, Lady Kenmare and her son Rory Cameron at La Fiorentina on Saint-Jean-Cap-Ferrat, and Le Clos Fiorentina, the one-time retreat of Rory Cameron following his departure from Villa Fiorentina. Le Clos Fiorentina photographed in 1995 by Pascal Chevallier. 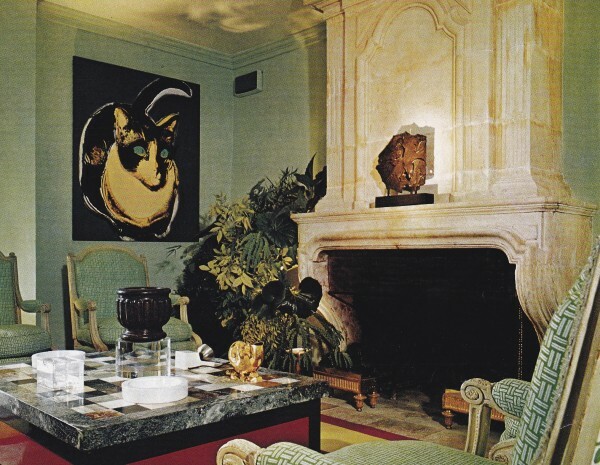 Le Clos Fiorentina has been decorated and redecorated, photographed and rephotographed, several times over the years, from its occupation at the time of Rory Cameron to the Schlumberger’s who hired David Hicks to refresh its interiors in saturated color in Hicks’ signature classic-modern style, to more recently by Hubert de Givenchy, who injected its interiors with his own soigné style and restraint. 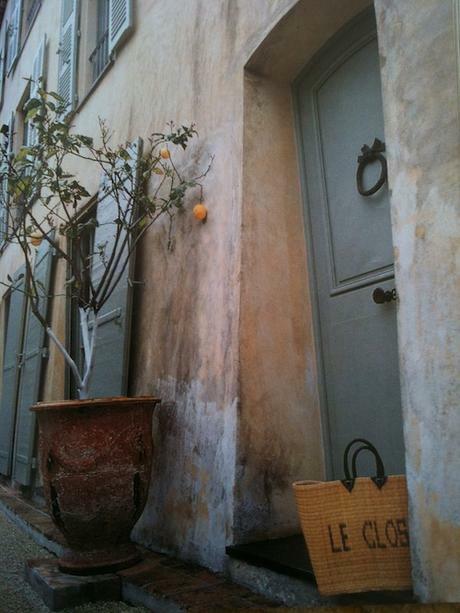 Le Clos Fiorentina is one of the oldest, if not oldest, houses on the French Mediterranean. 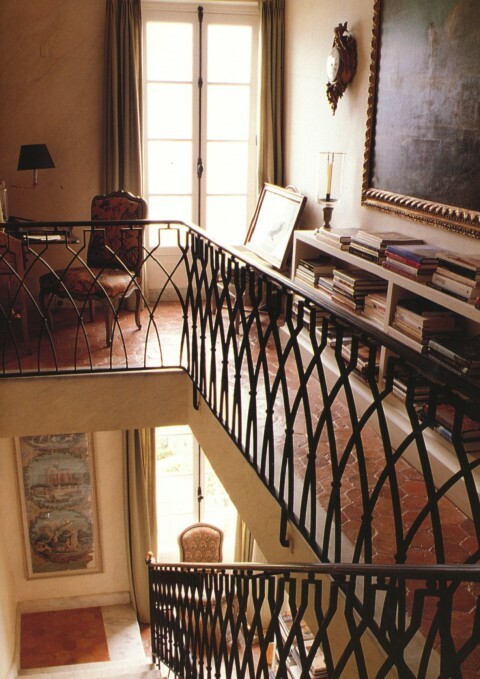 It was built in 1815, more than a century before cliff-side locations became fashionable for villas on the Cote d’Azur. 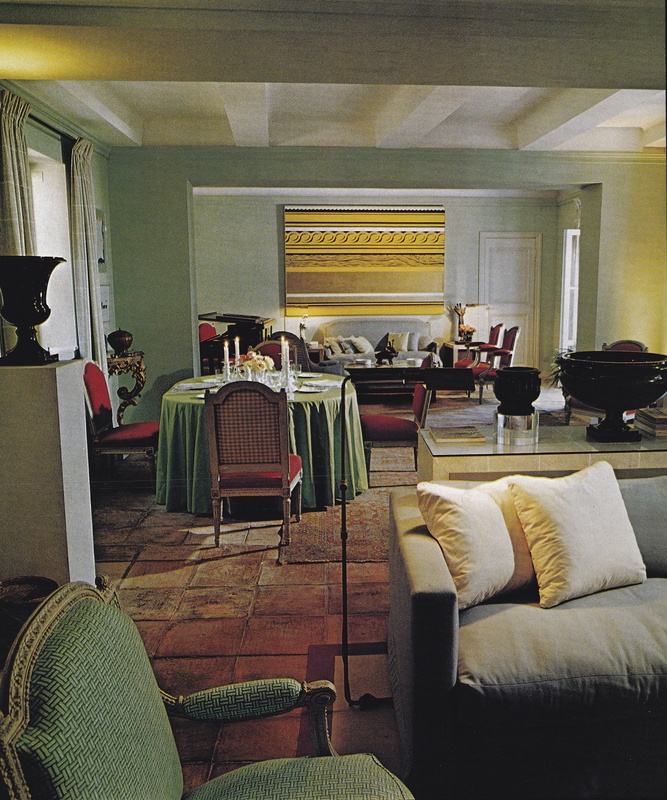 There are scant few photos of Le Clos at the time of Rory Cameron – surprising, given his passion for fine homes and interiors. The best and worst of the blogosphere has posted and commented on Le Clos so I won’t repeat what has already been said. 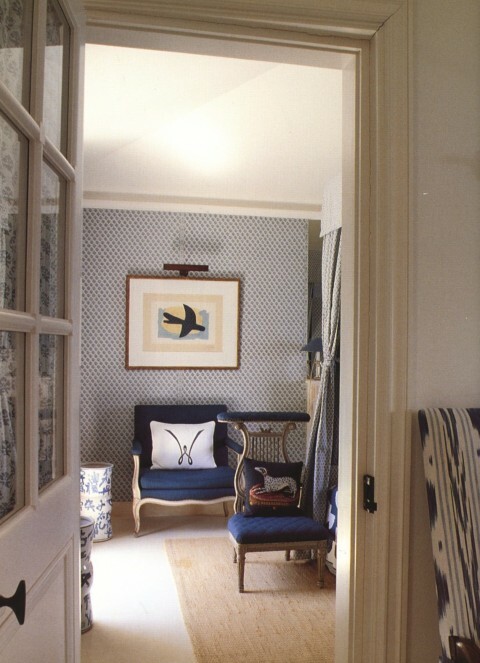 However, since I neglected to include photos of it in the last post – while including a version of its living room decorated by David Hicks – I felt coverage of Le Close would not be complete without inclusion of all known photos of its evolution. 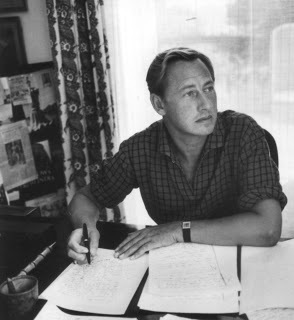 If you are interested in learning more about Rory Cameron he wrote The Golden Riviera, published in 1973, on his musings and insights into that region and his homes there. A colorful and interesting commentary on his life and homes is also available at The Blue Remembered Hills blogspot, for whom I am indebted for providing the following photos of Le Clos at the time of Rory Cameron. 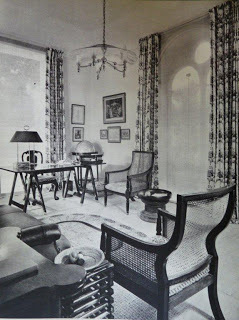 The Anglo-Indian room at Le Clos Fiorentina at the time of Roderick Cameron. 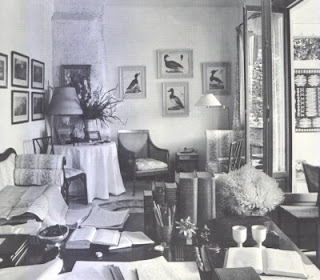 Cameron’s study at Le Clos. “…. 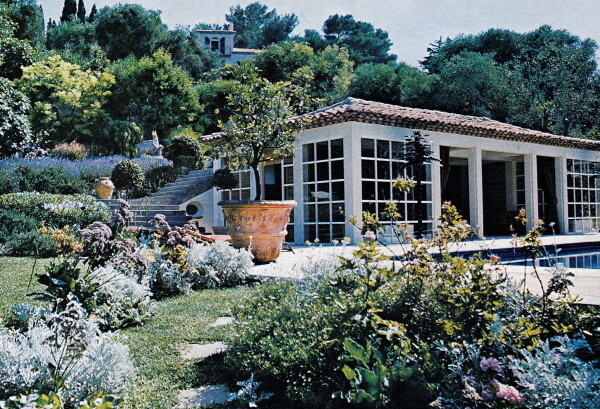 As to the house, [Le Clos] it dates from the end of the eighteenth century and is the oldest house on Cap Ferrat, or more exactly the Pointe St Hospice. It has no pretensions to architecture, but in its simplicity can lay claim to a good deal of charm, and is typical of the country: red tiled floors and white marble stairs, a Roman tiled roof, green shutters, and pinkish-ochre walls. Directly outside the front door stands the old covered-in well, once the house’s only water supply. Constructionally the alterations were few. The rooms were on the small side, which meant knocking down walls and adding the extra accommodation needed …” wrote Cameron in The Golden Riviera. 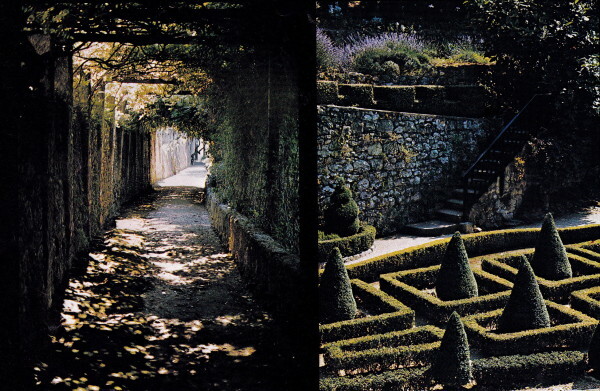 In photos taken for Architectural Digest at the time of the Schulemberger’s stone steps crowned with urns are bordered by oleander. The villa’s arched windows are flanked by green shutters, at right. The wall separating the living and dining rooms was torn down to create one large open space. 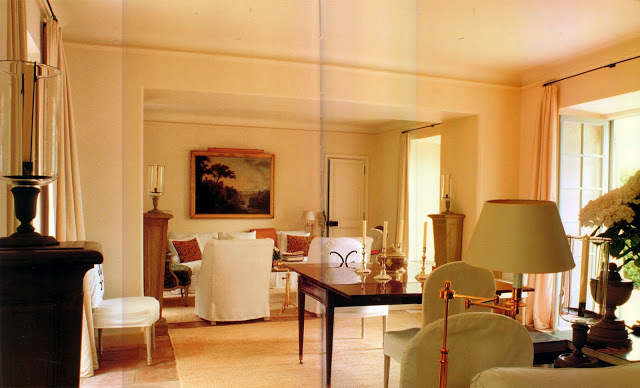 “Now the main living room has a dining table in it, in the French tradition. After all, the French never really had dining rooms until the 1840’s” said Hicks. 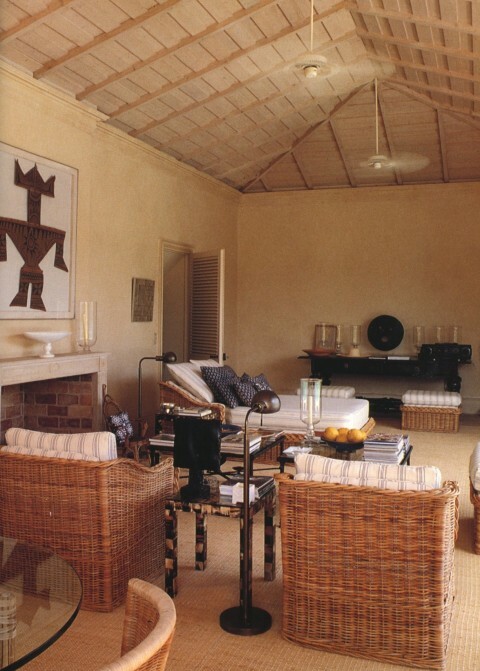 Fine Louis XVI fauteuils covered in simple patterned cottons mix with classic contemporary upholstery, a raffia covered console, and modern art to create an atmosphere of restrained elegance. “I love simple things as long as they have good manners” remarked Hicks. A Louis-XV stone chimney-piece compliments the rustic terra-cotta tiles covering the floors, imbuing the rooms with country life ease. 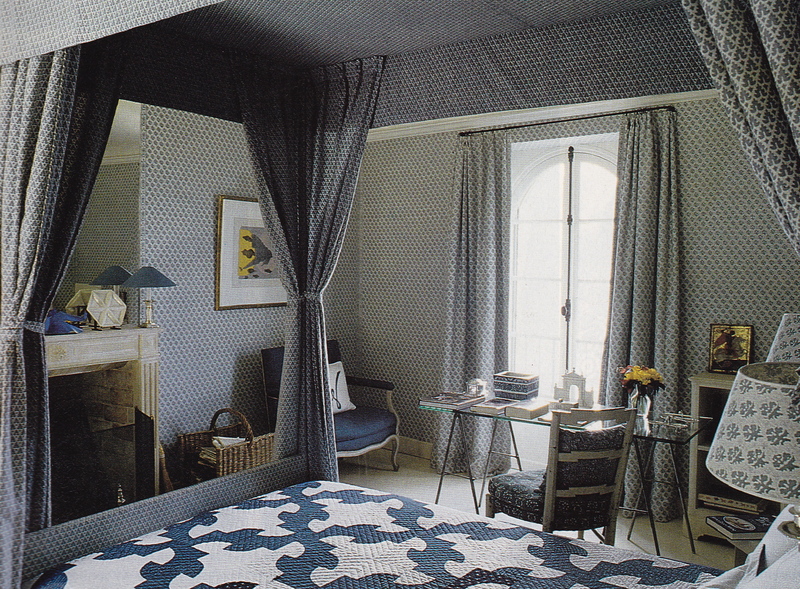 Contemporary curtained and upholstered beds mix with Continental antiques in the bedrooms. 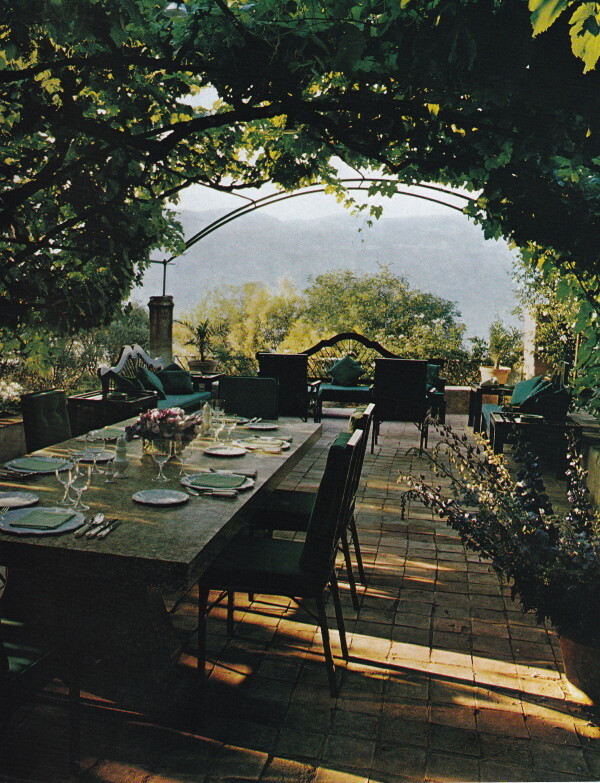 The indoor-outdoor lifestyle is celebrated here on the dining terrace where dinner was served. Lunch was served in the Pool House, which had interiors draped in Etruscan red sailcloth. Hicks lined the pool with deep blue terrazzo tile to match the color of the Mediterranean beyond. A vine covered walk leads through the gardens, on left; parterres of boxwood surrounding topiary cones extends French gardening traditions. 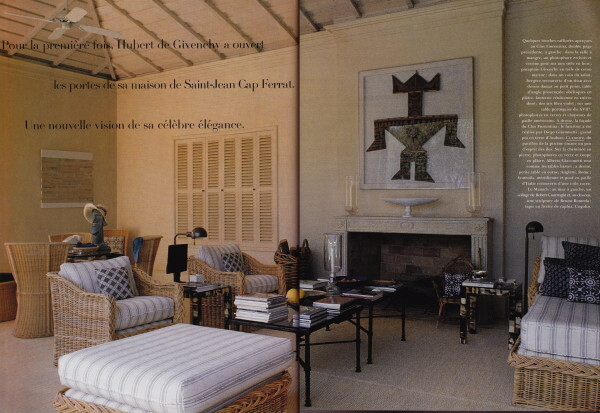 Count Hubert James Marcel Taffin de Givenchy (Hubert de Givenchy) acquired Les Clos sometime around 1985, about ten years after David Hicks had decorated it for the Schlumberger’s. But somehow, some way, the property deteriorated and required some renovation in that short amount of time. A view of Le Clos from the pool terrace. 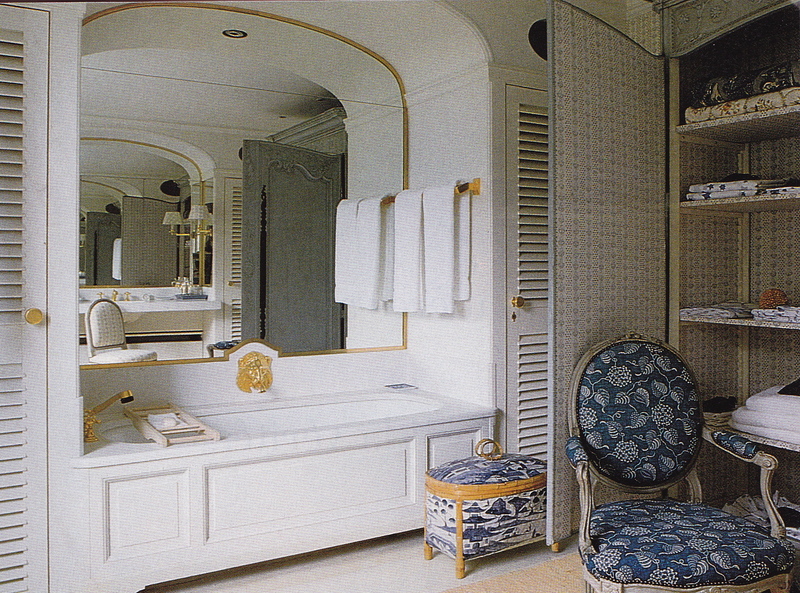 Here you will recognize Hick’s modernized open layout of the double salon, now in varying shades of white. 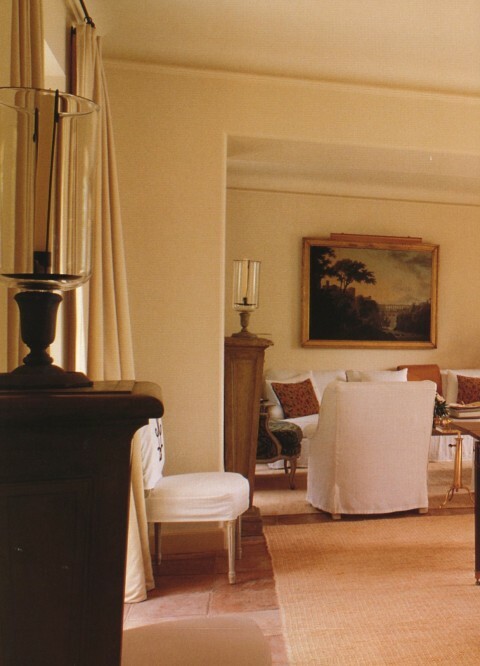 A wonderful balance of classic and casual elements is woven through the design of the interiors: Louis XVI chairs are covered in simple white slip covers; stripped Directoire pedestals are topped with provincial photophores. 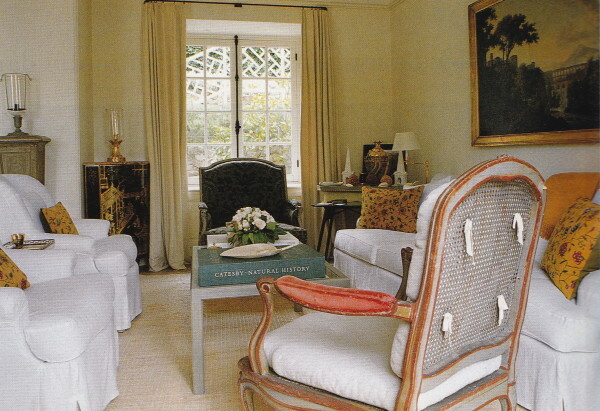 Simple white linen for slipcovers and canvas for curtains, and natural woven rugs, provide a quietly subdued foil for a selective and well-edited collection of furniture and objets d’art – a black and gold Louis XV cabinet; shots of yellow-gold in four petit-point pillows, and two Louis XV bergères, one black and the other, in the foreground, painted gray and gold with red velvet upholstery underneath the white slipcover. 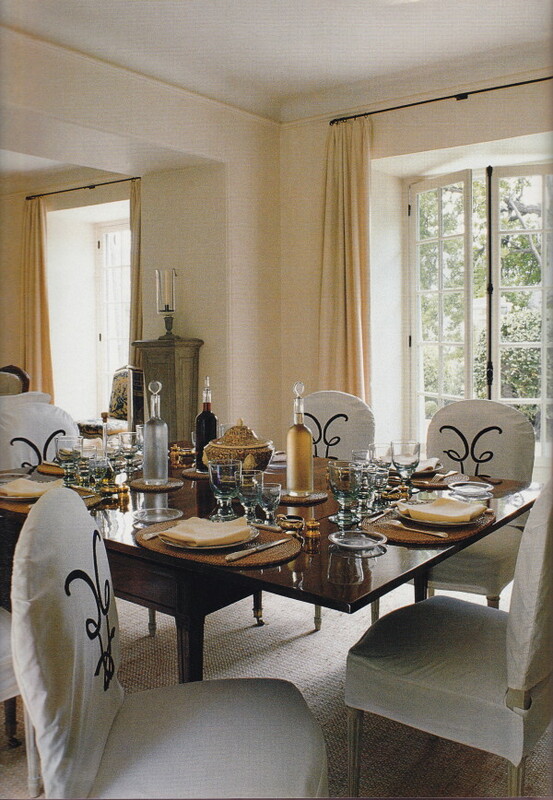 Clean and crisp: white cotton slip-covers with stylized HdG monograms surround a mahogany table dressed for summer with straw placemats, simple cotton napkins, clear crystal Baccarat decanters and provincial stemware. 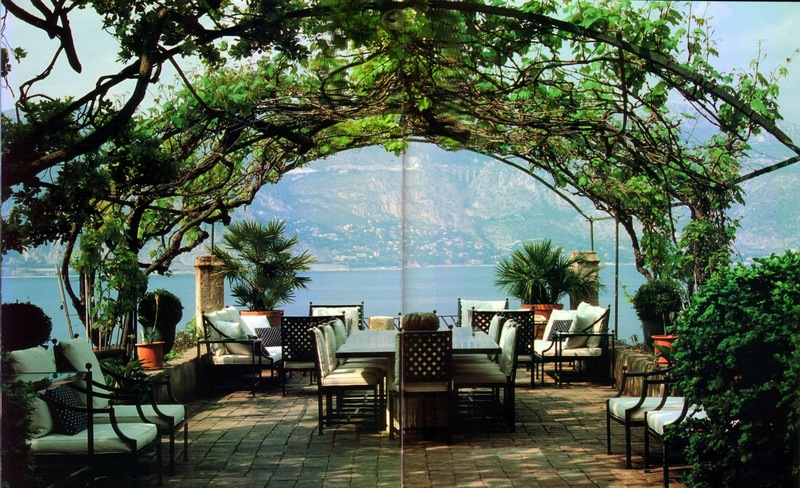 The dining terrace remains virtually unchanged, with symmetrically placed arrangements of furniture. I was fortunate to discover this photo of the Pool House in the issue of Maison et Jardin in which Givenchy’s villa was featured in 1995. 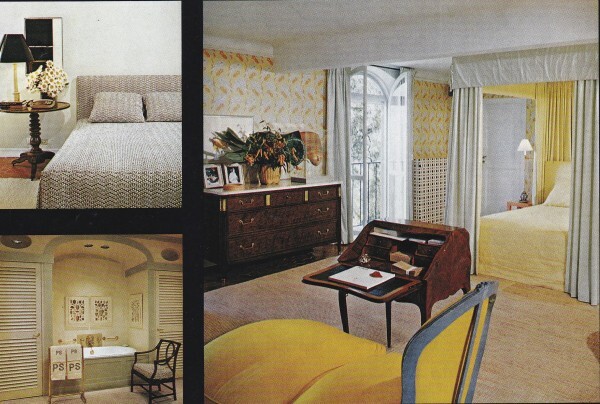 Though covered with verbiage and a seam down the center it’s always exciting, for me at least, to discover never before seen images of famous interiors. From this perspective we are allowed a close-up glimpse at Givenchy’s personal inner sanctum. An inviting mix of styles, provenance and textures produces a striking and timeless result – pale overscale Italian wicker furniture covered in striped canvas with Provencal patterned pillows; a pair of iron Diego Giacometti tables; contemporary horn veneered pull-up tables from Rome; a collage by Robert Courtright hanging above the dining table; an African carved wood sculpture framed above the fireplace; and, best of all, stacks of books and sources of candlelight for atmosphere – the whole bathed in a peaceful shade of diluted ocher. In this view for which we are most familiar of the Pool House one can’t help but be seduced by the relaxed elegance of this space, with a chaise designed and placed to take in full advantage of the view towards the pool and beyond, and for Givenchy’s love of photophores. Such an inviting atmosphere! The upstairs landing is lined with books and, yes, more photophores. 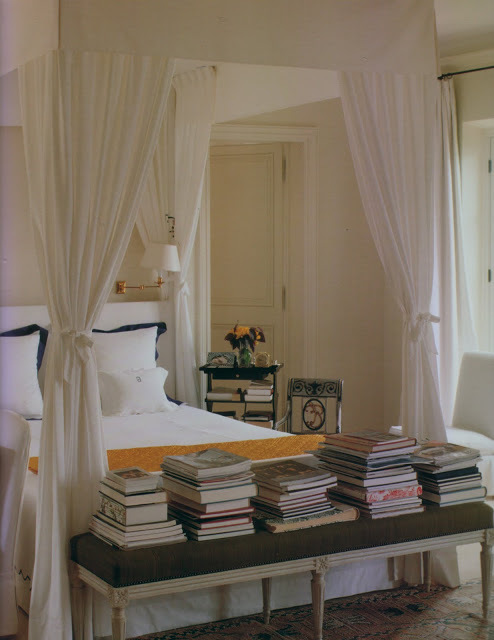 Givenchy’s bedroom is a study in quiet luxury: a canopy bed draped in white cotton with sheets trimmed in navy; an understated slipper chair; bare walls and pale floors punctuated by a subtly patterned 17th-century carpet … and more stacks of wonderful books. The daffodil yellow bed throw is a wonderful punctuation. 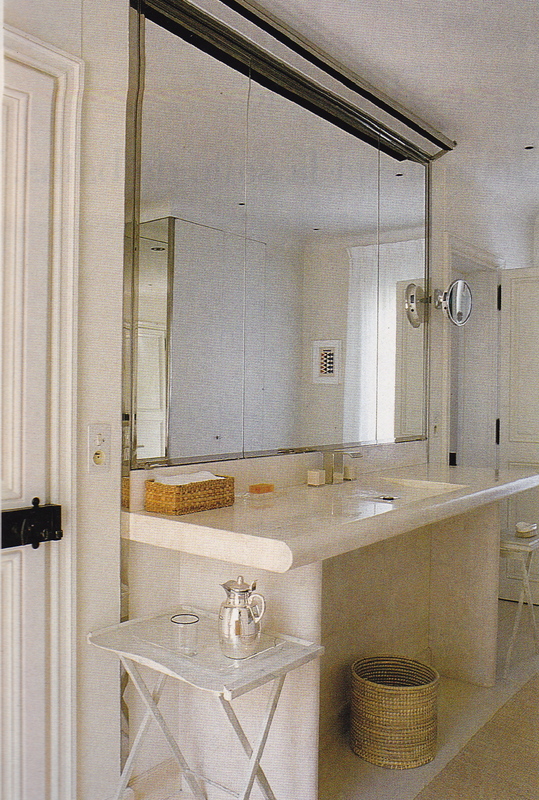 Francois Catroux collaborated with Givenchy on the design of the travertine console-style bathroom sink in Givenchy’s bathroom. 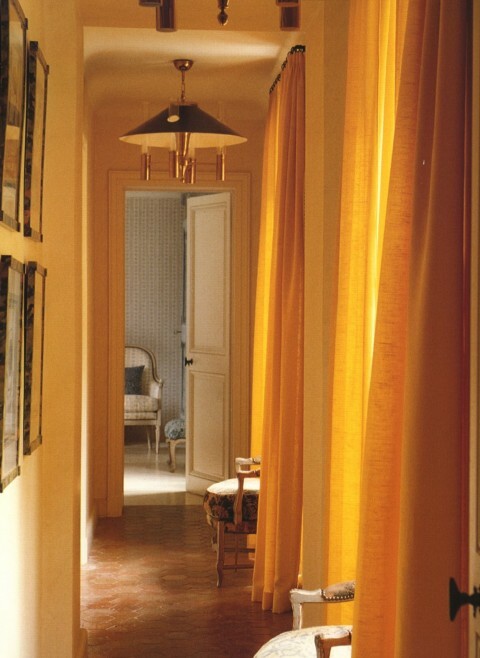 Golden light filters into a hall upstairs that leads to the guest bedrooms. 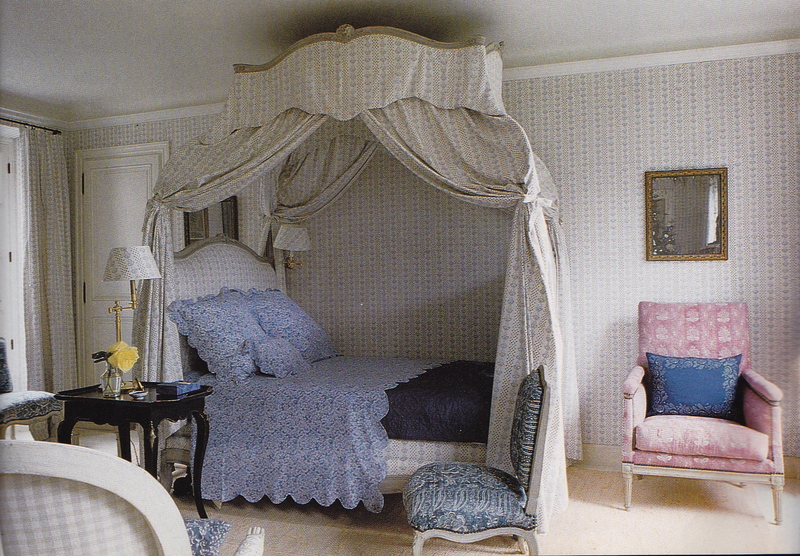 The “Bunny Guest Room” was decorated for Bunny Mellon. The “Walter Guest Room” was designated for war hero and diplomat Walter Lees. A graphic American 19th-century quilt on the bed compliments the Fortuny blue-and-white pattern-on-pattern scheme. A view into “The Walter Guest Room”. 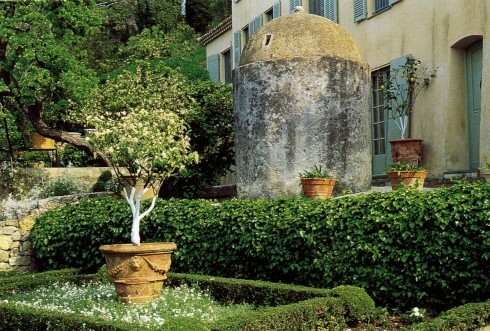 Potted citrus set into parterres greet visitors as they approach Le Clos. The raw appearing structure just before the front door is a 17th-century well. 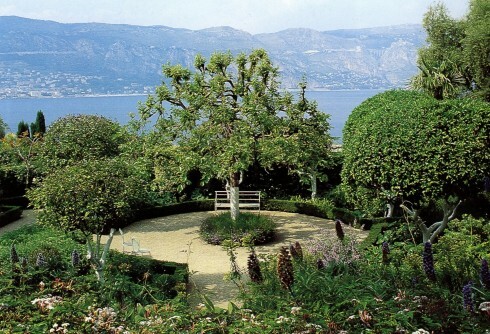 A circular terrace is framed by citrus trees. 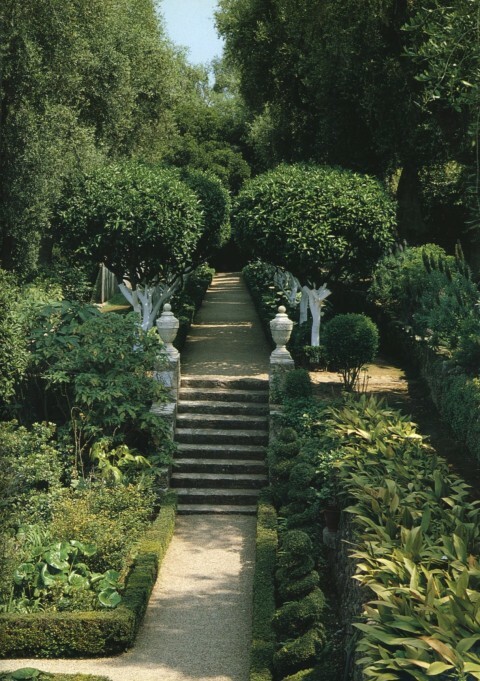 An Italian style garden leads to an allée of mandarin tress. In my next post I will feature Villa Corinne decorated by Nicky Haslam on Saint-Jean-Cap-Ferrat. Photos of the Schulemberger’s stewardship with interiors by David Hicks taken by Pascal Hinous for Architectural Digest, January, 1978. 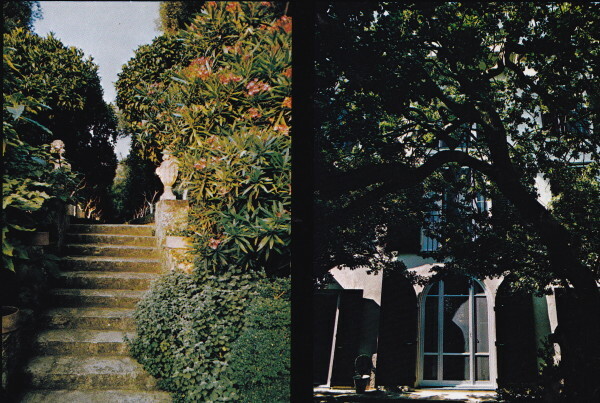 Photos of Le Clos as occupied by Givenchy taken from The Givenchy Style by Francoise Mohrt (Oct 1998) and Maison et Jardin, November, 1995, with photography by Pascal Chevallier. What a treat these photos were! Thank you. Thank you, Michele, for your enthusiastic comment!